Summer flowers are so different from spring flowers. Smaller, less juicy. 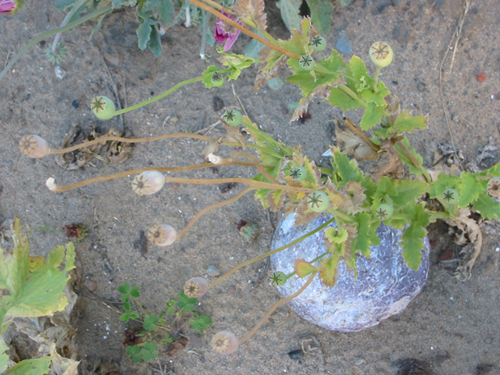 Long, dry stalks. Leaves that can cope with less water. Even when I gardened on the East Coast and had real summer rain, the difference was noticeable. This tiny little guy is Roella cilata. It's South African, and gets to be about two feet tall. Mine is about three inches tall right now, but coming out with these lovely blue flowers that open wide in the sun and then curl up when the shade from the fence falls on them. If you ever get a chance to see an entirely South African garden, go! There's one in the Leaning Pine Arboretum and in the spring it's this surreal swath of colour. It explains why people were so keen to stay there. 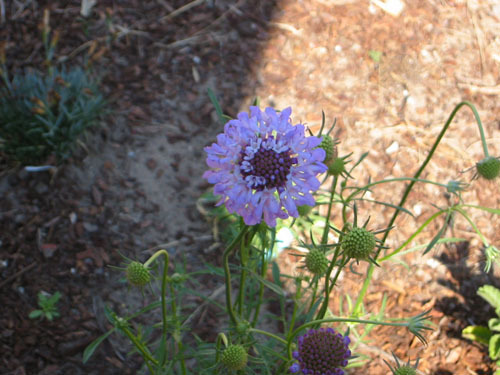 I have two Scabiosa plants, purchased on a whim because I love them and was having Animal Issues with starting them from seed. They open slowly, from the outside in, and every day is like a little gift. I think this is Scabiosa cretica, which has some really cool round seed heads. I've been enjoying the poppies this week, too. 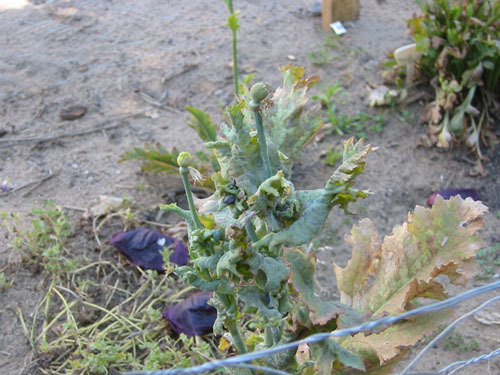 This is what appears to be Papaver 'Raspberry Breadseed,' but of course I didn't get plants with labels so I'm not sure. 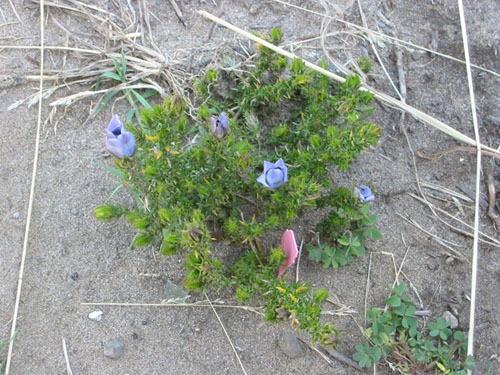 The flowers are dark, dark purple with darker blotches (not visible here) at the base. The petals are shiny and shimmery. This seedhead appeared yesterday, fresh and green. 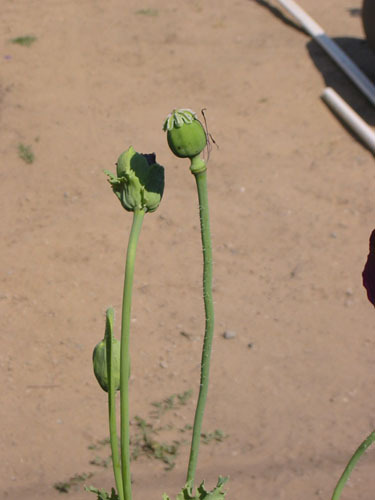 I like big, round seedheads on poppies, like little fat saltshakers on a stick. The wonderful thing about these poppies is that they get to be three feet tall. A little silly in the garden right now, as sparse as it is, but eventually, I hope they fill in and make a mass of plants. 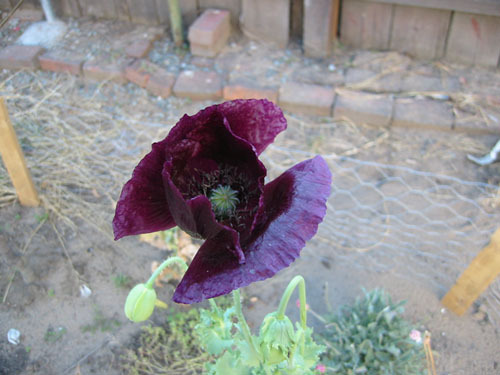 This is 'Lauren's Grape,' one of the few poppies I got that had a label on it. It's been blooming on the sly, the damned thing, so I see the first peeking petals one minute and the next time I turn around they're strewn all over the ground and the seed head is peeking at me slyly. As the seed heads dry out, I pick them off and shake them all over the bed to get ready for next year. On the smaller seedheads, the seeds are teeny-tiny, more like pepper than what we're used to as poppy seeds in the kitchen. 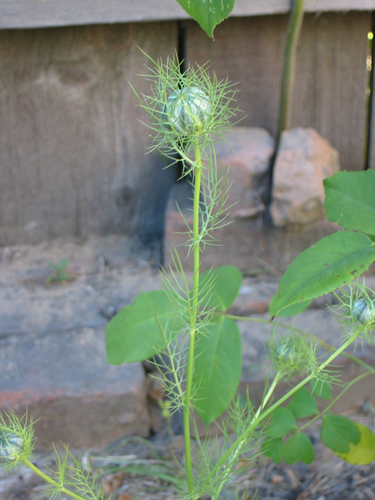 Also sneaking up on me is the Nigella damascena, a weird and interesting flower that self-sows all over the place. It's all covered in puffy buds, getting ready to bloom for the house's birthday party on Saturday. 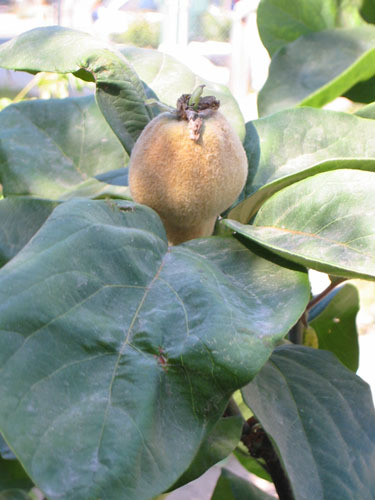 The quince fruits are growing slowly. They're all fuzzy and cute. One of them fell off last week, jettisoned in the early summer fruit drop. I think this says that five quinces was too many for the tree to support, but it was just fine with four. Wow, my Nigella started blooming almost 2 months ago. They're pretty much done now. According to Sunset, P. orientalis flowers form without a stalk when it doesn't get cold enough in the winter. I had the same same problem. I know: crazy, isn't it, with the Nigella? I was feeling bad because it hadn't done much, and then it put out all those buds. I think the poppies are just sort of settling in: I bought them kind of late, and haven't watered them at all. Though I wonder if the climate in Richmond (they're from Annie's) had some effect on it. Here's what you have to look forward to with the Nigella. Annie's is colder than Alameda, yes? We bought our poppies on a whim from that place in Lafayette (in Jan.? ), which is considerably colder in the winter. 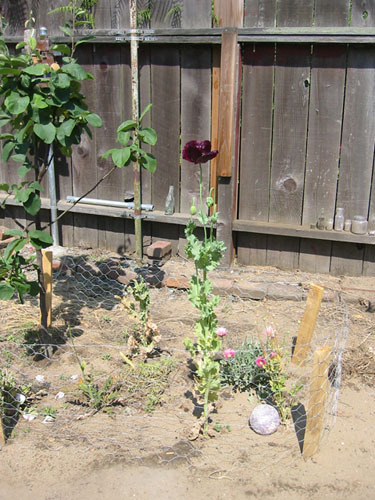 We planted them almost immediately, and got only that one unhappy flower I linked to above. I will be sad if we can't grow P. orientalis here. I think Richmond is warmer than Alameda. I've entertained some thoughts about chilling some plants in the winter by dumping ice on them. wow...I found your site on an image search for "shipping containers", and have been reading the progress of your house for the past several hours. simply amazing! you did an outstanding job on the whole project, though I'm sorry you had to go through so much of an ordeal with the first company. hope everything continues well!